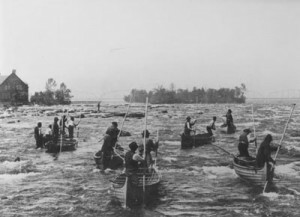 Fishing at the rapids on St. Mary’s River circa 1885. Whitefish Island is tucked in near the northern bank of the St. Mary’s River that runs between Sault Ste Marie Ontario and Sault Ste Marie Michigan. The island is minutes from downtown Sault Ste Marie but is devoid of development and has rural feeling. It is tear shaped, approximately 1 km long, and home to many species of flora and fauna. In the warmer months the island is frequently used by walkers, bird watchers, bikers, and those seeking an escape from the city. After crossing the Sault Ste Marie Canal onto Whitefish Island visitors are greeted by a sign welcoming them to Batchewana First Nation. If it wasn’t for the large welcome sign many visitors might not realize that the land doesn’t belong to the City of Sault Ste Marie. This sign is the first indication of the complex history of the site and the familiar narrative of Indigenous and settler relationships that has played out on the small island. Whitefish Island was designated a national historic site of Canada in 1981 because of its rich history. The island’s past includes serving as a place of permanent Anishinaabe settlement, a fishing base, and later a important trade location. The earliest written accounts of the island date back to Jesuit reports from the 1600s describing the fishery at the rapids, and the use of the land by the Anishinaabe from spring until winter while they net fished whitefish. The island itself is a historic meeting place and traditional burial grounds for the Anishinaabe people. In recent years Batchewana First Nation has often held Aboriginal Day celebrations, traditional teachings, and educational workshops on the island. The First Nation has also begun to recreate some of the structures that would have appeared therein the 1900s and hopes to continue to educate people about the rich Anishinaabe history and culture associated with the island. Given the proximity to Sault Ste Marie, and the usage of the island by the general population, it isn’t all that surprising that the ownership of the land, usage rights, and general policies around the island have been contested. The 1850 Robinson-Huron and the 1859 Pennefather treaties both retained Whitefish Island for Batchewana First Nation. It was an established home of the Anishinaabe, acted as a centre of trade, and was a significant point in the travel route between Lake Huron and Lake Superior. In 1899 four railway companies – the Algoma Central Railway, the Pacific and Atlantic Railroad Company, the Hudson’s Bays and Western Railway, and the Ontario and Lake Superior Railroad – became involved in litigation which resulted in the expropriation of Whitefish Island under the Railway Act. Following this expropriation of traditional land many of the Anishinaabe who had previously resided on Whitefish Island wereforced to relocate to Goulais Bay in 1905. By 1906 all residents were removed from the island and the traditional burial ground was relocated to Sault Ste Marie. In 1913, the Federal Department of Public Works took over the land from the railway companies. In 1980 Batchewana First Nation began a lengthy legal process to have Whitefish Island returned to them. After years of unsuccessful negotiations hereditary Chief Edward James Sayers Nebenaigoching occupied the island from 1989 until the land was returned in 1998. Whitefish Island is both First Nation territory, a national historic site, and a space that is frequently accessed by the public. Additionally, the nature of the island as a traditional meeting place and place of Anishinaabe settlement has resulted in it being deemed an important archaeology site. The high volume of visitors combined with a lack of public understanding about the nature of the site have resulted in some vandalism, damage to the site, and loss of artifacts from the island. In recent years there have been instances of members of the public removing items from the site without permission and trespassing on areas that the First Nation has placed off limits. Environmentally the island and the water surrounding it have changed significantly since the 1900s. The fishery that was once abundant grew less productive as waste and pollution from surrounding industrialization entered the water. The construction of the Sault Ste Marie Locks drastically changed the flow of the water over the rapids on St. Mary’s River which further impacted the environmental landscape of Whitefish Island. The 22 acres that makes up Whitefish Island is a significant historical and cultural site located in the heart of Baawitigong. The island is a unique local site but the history of Whitefish Island is also a familiar narrative. The expropriation of Indigenous land in Canada and the legal struggle to regain traditional territories and rights is occurring across the country. We are all treaty people and need to be aware of the traditional land we encounter. Baawitigong is the traditional Anishinaabe name for the area that was later called Sault Ste Marie. Are there any Commandas on White fish Island? My mother came from around St. Mary’s river.Are there any Mathias? Residential school 12 yrs. Looking for family. There currently aren’t any residents living on Whitefish Island. But, you could try contacting either Batchewana First Nation or Garden River First Nation both of which are near St. Mary’s River.